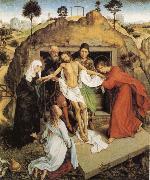 c.1399-1464 Rogier van der Weyden was the son of Henri de le Pasture, a cutler in Tournai, and Agn?s de Watreloz. His birthdate is estimated from the facts that he was stated to be 35 in April 1435 and 43 in September 1441. 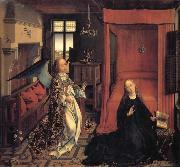 Before or in 1427 he married Elisabeth Goffaert (c. 1405-77), whose father was a prosperous shoemaker in Brussels. Rogier may have lived for a time in Brussels: his eldest child Cornelis (b 1427) was sometimes referred to as 'de Bruxella' but was not necessarily a native of Brussels. 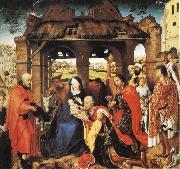 On 5 March 1427 'Rogelet de le Pasture, natif de Tournai' was apprenticed to the Tournai painter Robert Campin. 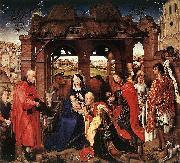 This Rogelet duly completed his apprenticeship in 1431 and on 1 August 1432 became a master of the Tournai guild. Despite much debate, it would appear that Rogelet was Rogier van der Weyden, though it has also been argued that in 1427 Rogier was a married man well past the normal age of apprenticeship and that Rogelet must have been a second Tournai painter of the same name. JACQUES DARET, however, was in his twenties when in 1428 he was apprenticed to Campin, and other instances can be cited of married apprentices. The political situation at Tournai in 1427-8 was unusual, and the guild system was not functioning normally.